Our work “Long-Acting, Potent Delivery of Combination Antiretroviral Therapy” has been published in ACS Macro Letters. Antiretroviral therapy (ART) has revolutionized HIV treatment, yet grand challenges remain: (i) short blood and body residence time of the antiviral drugs, (ii) relative poor antiretroviral drug penetrance into key tissue reservoirs of viral infection, namely, the spleen and lymph nodes, and (iii) obstacles in different pharmacokinetics of the necessary combination drugs. We present a novel drug delivery approach that simultaneously overcomes these limitations. We designed albumin–polymer–drug conjugates where albumin ensures long body residence time as well as lymphatic accumulation of the conjugate. 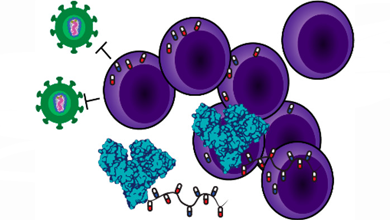 The polymer enabled the delivery of combinations of drugs in precise ratios affording potency superior to the individual antiretroviral drugs and strong protection from HIV infection in primary human T cells.